The city of Jodhpur was a spiritual experience, the kind hippie expats like Steve Jobs chased after in the 70''s. 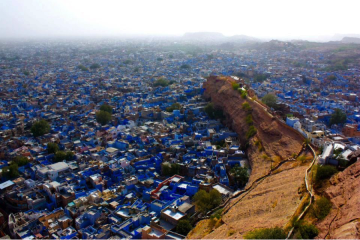 When you find yourself drenched in a water-fight during the festival of Holi, snaking through the passageways of Mehrangarh Fort, and finally stumbling upon a sprawling canvas of deep blue homes as far as the eye can see...when you find yourself experiencing all those things, this city will carve out a space in your heart as well. What do Batman, sweets, and blue dye have in common? They are all things that made the city of Jodhpur the pinnacle of my 2-week backpacking trip around the state of Rajasthan. In a region of India that includes its capital city (Delhi) and most popular tourist attraction (the Taj Mahal), it’s easy to see how a faraway city on the outskirts might be overshadowed. 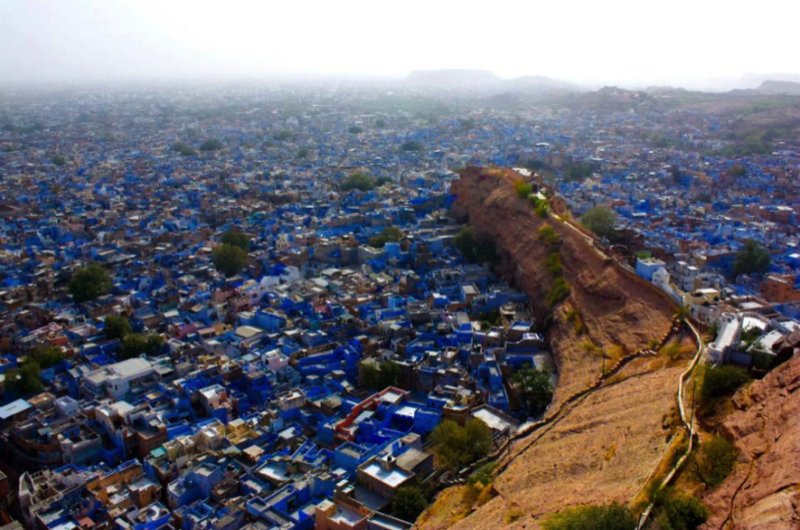 I never expected Jodhpur to be the top bookmark of my travels in India, but after spending a few days in the majestic city of blue-colored houses, there was no doubt. 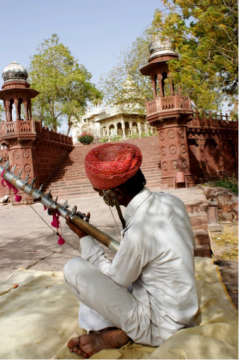 The city of Jodhpur was a spiritual experience, the kind hippie expats like Steve Jobs chased after in the 70”s. When you find yourself drenched in a water-fight during the festival of Holi, snaking through the passageways of Mehrangarh Fort, and finally stumbling upon a sprawling canvas of deep blue homes as far as the eye can see…when you find yourself experiencing all those things, this city will carve out a space in your heart as well. The Mehrangarh Fort – At the climax of the Batman blockbuster “The Dark Knight Rises”, Bruce Wayne/Batman finally triumphs from imprisonment in a pit-like prison by making the treacherous climb out without a rope. As he emerges out of the darkness, we see the breathtaking backdrop of a mountaintop fortress gleaming in the last rays of sunset. 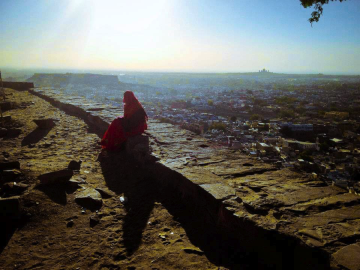 That fortress in the film was Jodhpur’s Mehrangarh Fort, and it was an awesome déjà-vu to realize that I had been walking along those same ancient walls just months ago. The Mehrangarh Fort is as badass of a fortress as they come, in the same league as the famous Inverness of Scotland or Camelot of Arthurian legend. It is built on the lone hill towering over the city, juxtaposing the strength of cannon-lined high walls with the beauty of intricately decorated interior quarters. Imagine the hand-painted rooms of Versailles inside the security of Alcatraz. Making your way up the cobblestone ramp, you narrow passageways, holy men smoking from hookah pipes, and tiny windows in the wall revealing an endless sea of blue homes. Seemingly all paths lead up to this focal site of the city if you’re up for the hike. If you’d rather take a tuk-tuk or taxi, be sure to get the driver to wait for you at the Fort, because otherwise it will be hard to find one to take you back down. Jaswant Thada – Next to the Mehrengarth Fort (literally walking distance), you can visit the Jaswant Thada, a memorial temple complex build in beautiful white marble. Compared to the Fort, it is a much more elegantly laid out site, with clean glistening marble floors, tree-laden walkways, and religious shrines. View over Jodhpur at Sunrise – This photo really embodied “a calm before the storm”. On the morning of the festival of Holi, with just hours to go before a citywide celebration of water fights and throwing of colored powders, I captured this serene moment of a woman looking over the city as the sun came up. No music, no birds…just the brush of a soft breeze. Juxtaposed with the loud frenzy and chaos that was to follow, this quiet moment was a spiritual one. The way the sun’s early rays hit off the deep blue homes creates a really lovely cocktail of both warm and cool colors. Playing Holi in the slums – I captured this thrilling moment while “playing Holi” (a celebration of throwing water and colored powder at each other) in the slums of Jodhpur. Here you can see a bunch of locals giddily dunking one of their peers in a vat of colored water. Like any place, the most authentic experiences that often elude cautious travelers are those hidden in local neighborhoods that may not initially seem tourist friendly. However, I found that after taking my first water balloon to the face with good sport, the local kids quickly embraced me as one of their own. There’s nothing like playing Holi in the country where it started and afterwards, warming yourself next to some equally-drenched new friends over a ring of smoldering coals. Even if a water fight isn’t really your thing, I encourage you to make a trip to the “slum” neighborhoods at least, if nothing else, to discover innate humanity of seemingly dissimilar peoples and chip away at the cultural socioeconomic walls we build around ourselves.